I've gotta be honest with you, Friends ... in my brain, such as it is, recitals don't get any better than Hampson singing Mahler. Well ... ok, back in the day, Marilyn Horne singing *anything* was pretty much out of this world. But, this isn't about her... that's an entirely different post. 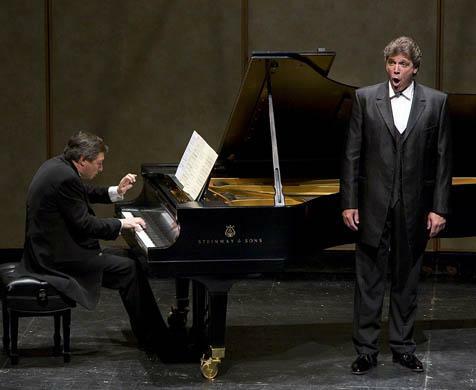 Long regarded as the premier interpreter of the songs of Gustav Mahler (1860-1911), Thomas Hampson will dedicate much of his summer and the upcoming 2010-11 season to performances of the Austrian composer’s works. The celebration begins on July 7 – the date of Mahler’s birth 150 years ago – with Hampson’s recital from Mahler’s birth-house in Kaliste, Czech Republic, that will be webcast live on www.medici.tv, and an evening concert from Kaliste with the Mahler Chamber Orchestra conducted by Manfred Honeck, which the European Broadcasting Union will transmit live across Europe. The webcast will also be available for streaming through www.medici.tv for 60 days following the performance. Additional Mahler performances will follow throughout the summer – making more than 50 concerts over the course of the 2010-11 season – including Lieder eines fahrenden Gesellen at the Zurich Opera with conductor Philippe Jordan; Rückert-Lieder with the Schleswig-Holstein Festival Orchestra and Christoph Eschenbach at the Rheingau and Schleswig-Holstein Music Festivals; and Das Lied von der Erde with the NDR Symphony Orchestra, Hamburg and Alan Gilbert on a four-city tour that includes the final concert of the Schleswig-Holstein Music Festival. Additional information about Thomas Hampson’s big Mahler season is available from 21C Media Group and ThomasHampson.com.